You are currently browsing the tag archive for the ‘rumors’ tag. The rumors are not true. 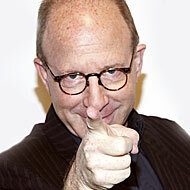 Jerry Saltz is neither leaving New York magazine nor is he shutting down Saltz Nation on his infamous Facebook page. But seriously. In response to the funny widespread “news” that I’m quitting New York and scrapping my Facebook page: Neither is true, and that “farewell” post was not written by me. If I leave the magazine, I’m going out feetfirst (because I’m dead) or headfirst (because they’re throwing me out). They had me at, “We have cashew Fridays,” and now I’m addicted to getting e-mails from editors proposing “just one more revise” of my column, or blog entries that they want in 45 minutes, and constantly going to galleries out of sheer deadline pressure. And anyway, those limited individuals who structure their inner lives around hating my work, both on New York’s online-comment threads and in the blogosphere at-large, all seem to need me more than I need them. I may be keeping them off the streets, which might be viewed as a public service. As for scrapping my Facebook page, alas: My wife says this pastime keeps me out of her hair and has, relatively speaking, a “calming effect” on me. It’s staying around, too. It’s a good thing since Jerry is one of the few people I follow who actually makes the art world fun (and funny.) And if there was ever need for some levity, it is now.